This sandwich is a super easy sandwich can be eaten as raw or grilled. So healthy as the veggies are not cooked. Can be made in minutes and suits for travel too. You can prepare instantly where ever you are. 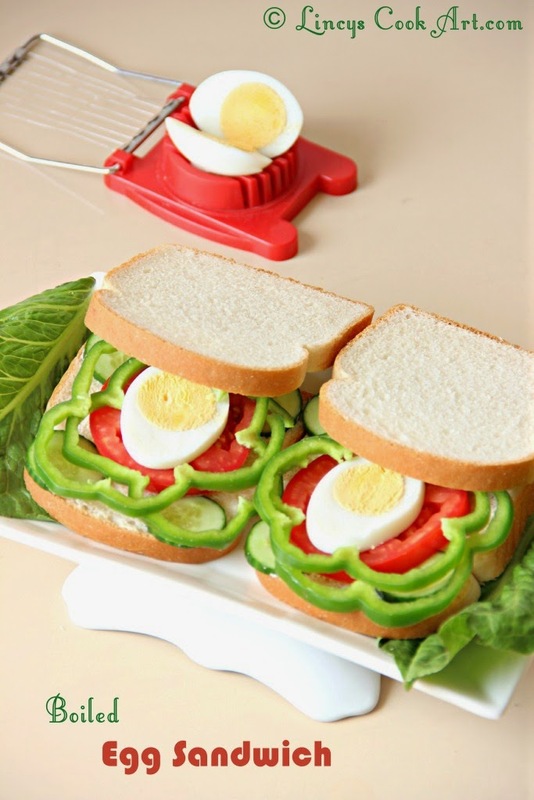 You can prepare this sandwich for picnics too on the spot. Simple yet delicious sandwich. I always make this sandwich when i feel lazy at the morning or even for some days for dinner. So simple to make and sure will be liked by all age groups. The mayonnaise with all the crunchy veggies tastes really nice. Top the veggies with your choice of sauce Tomato sauce, Chilli sauce or Mustard sauce..etc. Even without sauce it tastes really really good. Hard boil the eggs in cold water for about 5-8 minutes. Peel them and slice them using egg slicer or knife as thin slices. Take the bread slices and apply Mayonnaise on a slice of the bread. On top of the bread slice keep the cucumber slices on the edges of the bread. Then on top of that keep the tomato then Keep the cut egg slices and spread capsicum on the sides of the egg and cover with Lettuce leaf. Now keep another slice of bread on top of the veggies and lightly press and serve. You can drizzle Tomato ketchup, Chilli sauce or Mustard sauce on top of the veggies as per your choice. You can add Jalapenos for spiciness if you like. Super easy and also very filling sandwich. Beautiful clicks as usual. Super easy and super duper yum. 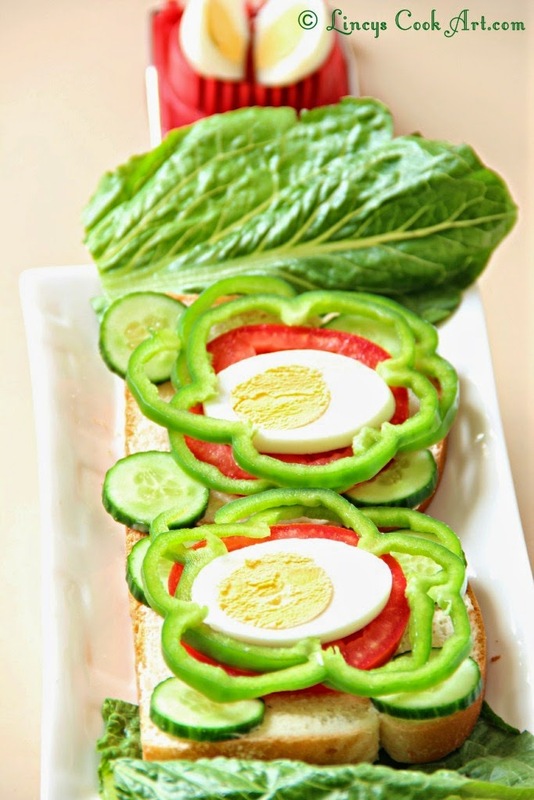 Love to finish that super beautifully arrange sandwich, delicious..